Though the new Congress convened in Washington last week, Americans focused most closely on news about the nation’s economy – until they heard about Saturday’s shooting rampage in Tucson, Ariz., that left six dead and a congresswoman fighting for her life. At that point, the shootings became the public’s top story. Before the Jan. 8 shootings, which drew high initial interest that was only expected to increase, the economy was the public’s top news story, although the incoming Republican leaders in Congress drew much more news coverage. Public perceptions of the tone of economic news have become much less negative over the past month. In fact, the percentage saying they are hearing mostly bad news about the economy has dropped to its lowest point since the question was first asked in December 2008. Currently, 24% say they are hearing mostly bad news, down 15 points from 39% in early December. The proportion saying they are hearing a mix of good and bad news has jumped from 55% last month to 68% in the new survey. However, as has been the case for the past two years, very few say they are hearing mostly good economic news; just 7% say this, which is little changed from 4% in December. The latest News Interest Index survey, conducted Jan. 6-9 among 1,018 adults, finds that Republicans, in particular, are much less likely to say they are hearing mostly bad news about the economy than they were just a month ago. 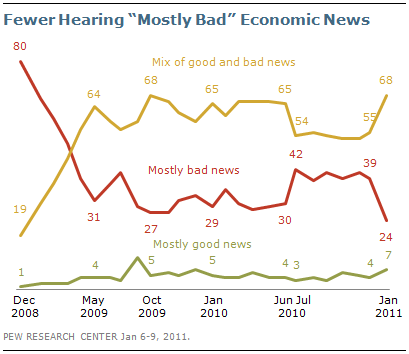 Currently, 24% say they have been hearing mostly bad news, half of the number that said this in early December (50%). Seven-in-ten (71%) Republicans say they are hearing a mix of good and bad news about the economy, up from 47% in December. The changes among independents and Democrats have been smaller but are in the same direction: 17% of Democrats say they are hearing mostly bad news, down from 29% in December. 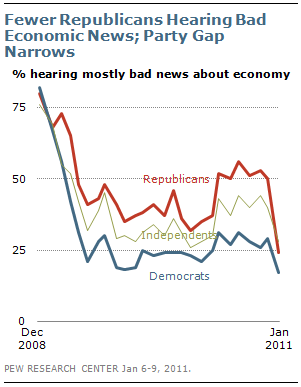 Among independents, 28% say they are hearing mostly bad news about the economy, down from 40% in December. Through most of the Obama administration, Republicans have been far more likely than Democrats to say the economic news they are hearing is mostly bad. In early November, for example, Republicans were twice as likely to say this (53% vs. 26%). Now, as the number of Republicans taking the most negative viewpoint has dropped, the partisan gap has narrowed to just seven points (24% of Republicans vs. 17% of Democrats). 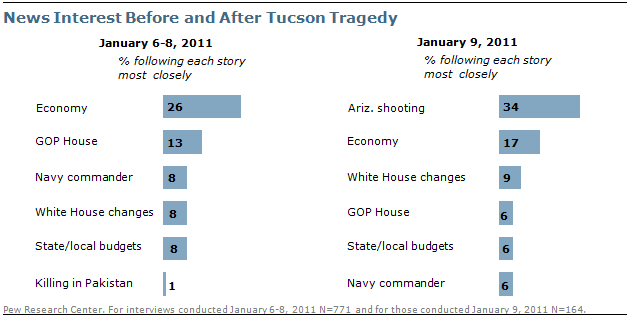 The weekly News Interest Index survey was being conducted when the Jan. 8 shootings in Tucson occurred. Before the rampage, Americans said they were tracking news about the economy most closely, but in the survey’s fourth and final day – the Sunday following the horrific events in Arizona – 34% said they were following news about the shooting of Rep. Gabrielle Giffords most closely, double the 17% that said they were following news about the economy most closely. During the first three days interviewing (Jan. 6-8), the economy was the top story for the public, with 26% following economic news most closely compared with 13% who cited news about incoming Republican leaders. By contrast, news about the incoming Congress made up 18% of coverage for the week, much more than any other story, according to a separate analysis by the Pew Research Center’s Project for Excellence in Journalism (PEJ). News about the economy accounted for 8%. The public showed moderate interest in the GOP taking control of the House of Representatives and most Americans say they heard at least a little about specific congressional actions and plans. In most cases, however, far fewer than half say they heard a lot about developments in the new Congress. The GOP’s efforts to repeal the health care law are registering widely with the public – 49% say they have heard a lot about these efforts. 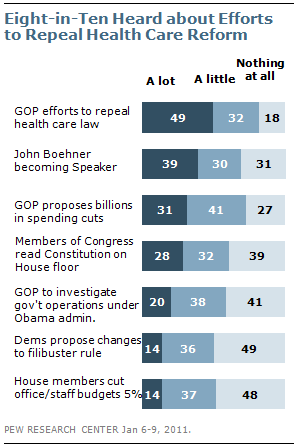 Fewer (39%) say they heard a lot about John Boehner becoming the new House speaker. Only about three-in-ten say they heard a lot about Republican proposals for billions of dollars in spending cuts (31%) and members of Congress reading the Constitution on the House floor (28%). Even fewer heard a lot about GOP plans to investigate government operations under the Obama administration (20%), the Democrats’ proposed changes in the Senate’s filibuster rules (14%) and members of the House reducing office and staff budgets by 5% (14%). Partisan differences in awareness of these stories are generally modest. However, Republicans are more likely than Democrats to hear a lot about Boehner becoming speaker (47% of Republicans vs. 36% of Democrats) and members of the House reading the Constitution (33% vs. 23%). Before the horrific shootings in Tucson captured the public’s attention over the weekend, Americans focused most closely on news about the economy – including positive reports about corporate profits and mixed news on the jobs front. About four-in-ten (39%) said they followed news about the economy very closely, matching the level of interest in the final weeks of December. A quarter (26%) said this was the news they followed most closely. The media devoted 8% of coverage to the economy. That does not include 2% of coverage that went to news about budget problems facing state and local governments. About a quarter of the public (24%) said they followed this news – featured prominently in the inaugural speeches of several new governors – very closely, while 8% said this was the news they followed most closely. About a quarter (26%) said they followed news about the incoming GOP leaders of Congress very closely, just about matching the 25% that said they followed news about incoming Democratic leaders that closely in January 2007. More than one-in-ten (13%) said this was the news they followed most closely. News about incoming officeholders nationwide filled 21% of the newshole, almost all about the new Congress (18%), according to PEJ. Nearly two-in-ten said they very closely followed news about changes in Barack Obama’s White House staff (19%) or news about the Navy commander relieved of his post because of his role in inappropriate videos broadcast on his ship (18%). Fewer than one-in-ten (8% each) said this was the story they followed most closely. The changes in the administration’s top staff accounted for 6% of coverage, while the actions taken against Capt. Owen Honors accounted for 4%. Just 7% said they very closely followed news about the assassination of a prominent Pakistani politician, which added to the political instability in that nation; 1% said this was the news they followed most closely. News about the assassination and its repercussions accounted for 3% of coverage. These findings are based on the most recent installment of the weekly News Interest Index, an ongoing project of the Pew Research Center for the People & the Press. The index, building on the Center’s longstanding research into public attentiveness to major news stories, examines news interest as it relates to the news media’s coverage. The weekly survey is conducted in conjunction with The Project for Excellence in Journalism’s News Coverage Index, which monitors the news reported by major newspaper, television, radio and online news outlets on an ongoing basis. In the most recent week, data relating to news coverage were collected January 3-9, and survey data measuring public interest in the top news stories of the week were collected December 6-9, from a nationally representative sample of 1,018 adults. Results for the weekly surveys are based on telephone interviews conducted under the direction of Princeton Survey Research Associates International among a national sample of approximately 1,000 adults living in the continental United States, 18 years of age or older. For results based on the total sample, one can say with 95% confidence that the error attributable to sampling is plus or minus 4 percentage points. Results for the latest survey, conducted January 6-9, 2011, are based on a national sample of 1,018 adults (687 respondents were interviewed on a landline telephone, and 331 were interviewed on a cell phone, including 136 who had no landline telephone). Both the landline and cell phone samples were provided by Survey Sampling International. Interviews were conducted in English.